The new scheme is called Redd—reducing emissions from deforestation and degradation of forests. It is estimated that deforestation generates 20% of global carbon dioxide emissions. Redd supporters, therefore, propose that developing countries should be paid to preserve forests instead of clearing them. Brazil, India, Indonesia and many other countries now support this scheme. India wants to go further and include payments for afforestation, too. As the environment minister put it to Hillary Clinton, India wants the scheme to “reward countries who are in the business of actually expanding forest cover". Finally, India and other governments propose that much of this money can come through carbon trading. Companies here can earn “carbon credits" by Redd activities; Western companies can then buy these credits in order to meet their emissions targets. Sounds like a classic free-market win-win solution, right? But like most such solutions, it is actually too good to be true. Forests are much more than trees; they are entire ecosystems, the habitats of people and wildlife. People depend on them for water, medicines, fuel, food, access to wildlife and their spiritual and cultural requirements. Moreover, in India and across the developing world, forest law was often framed by colonial rulers, whose aim was to expropriate timber and land that actually belonged to local communities. As a result, “government forest land" today includes everything from community forests through village commons through people’s individual lands. Across the world, there are ongoing struggles by people, especially indigenous peoples, to reclaim the resources that were robbed from them. In India, the most recent manifestation of this conflict was the Forest Rights Act of 2006. In this situation, if a monetary value is put on forests—these many trees mean this much cash—the potential for abuse is huge. Two basic questions arise: Who will manage these forests, and how? And, secondly, who gets the money? Neither has an easy answer. Even from the viewpoint of carbon dioxide absorption alone, there is no easy or agreed way to calculate whether a forest is absorbing more carbon dioxide than would otherwise have been absorbed. Then there are forests’ other uses. For instance, in Redd forests, will the forest “protectors" allow people to exercise their rights to non-timber forest produce, grazing and, in some areas, to timber? Or will they legally or illegally stop all use to protect “their asset"? Plantations bring their own dangers. They are often located on grasslands, common lands and grazing areas, thereby damaging the environment, wiping out biodiversity and, at times, draining groundwater. 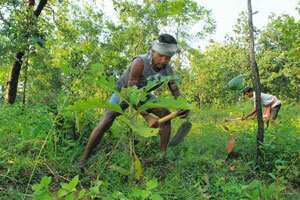 In India, the forest department also uses plantations to assert the claim over forest dwellers’ lands; thus, most recent cases of illegal eviction of forest dwellers by the forest department have involved undertaking plantations on the evictees’ lands. As for the money, should it go to the communities who use forests and have often protected them, but who generally have no recorded rights over them? Should it go to the forest department—often the recorded owner of resources that were illegally taken from people? And, most dangerous of all, should it go to private companies that plant trees on “forest" lands that may actually belong to forest dwellers? The carbon trading formula—which our government strongly supports—would imply the last. The resulting rush to grab forest land could dwarf current conflicts around land acquisition. Moreover, instead of respecting community forest management powers under the Forest Rights Act, the ministry continues to promote the failed model of “joint forest management" (JFM)—where a forest guard is the secretary and joint account holder of “participatory" joint committees, thereby ensuring that these committees are under the department’s thumb. Indeed, JFM committee members have joined forest officials in attacking poorer villagers during many recent illegal evictions. Overall, Redd will neither address climate change—given the ample possibilities of fudging carbon absorption—nor benefit India. Rather, it will be a giant scam, allowing industrial countries to continue polluting while officials and companies here mint money. Protecting forests can only be effectively done through democratic institutions that give people control over their resources—not by international schemes that convert forests into tradable commodities. If the government believes even a fraction of its rhetoric on “equity" and “ending exploitation", India should oppose Redd.